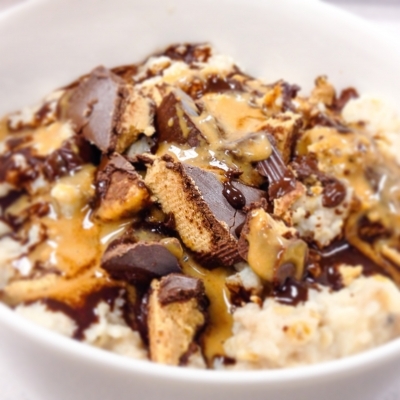 Reese Peanut Butter Oatmeal that is to die for and tastes amazing! Cook 1/2 cup oatmeal in 1 cup of water, mix in 4 egg whites and continue to cook until egg whites are cooked (4 minutes). Take off stove and pour into bowl, mix in 1 serving of PB2 and 1 scoop of Peanut Butter Marshmallow Whey. Top with 1 chopped Quest Cravings Cup, Walden Farms Chocolate and Caramel Sauce! Enjoy!